"I love people," says Rosemary Gladstar. "But I love plants even more." For starters, they're useful in ways people are not. "Everything we do depends on them -- our food, our air, our clothing. Plants form the basis of our most widely used medicine and our oldest method of healing." Gladstar, the godmother of American herbalism, knows that better than anyone. "I have been in the field literally. I grew up with herbs in my life." It started with an idyllic childhood on her father's Sonoma dairy farm. She felt "a profound relationship" with nature and learned about traditional herbalism from her grandmother. Back then, "if you mentioned you were an herbalist, people looked away politely." Polite -- or impolite -- looks have never stopped Gladstar. She founded the California School of Herbal Studies, America's oldest herbalist school, back in 1978, when she was in her twenties. From the cozy comfort of her Sebastopol community, Gladstar later moved to Vermont, where she knew no one. She immersed herself in "the community of plants." She found a comfort and connection there, too. She also found reason for concern. The herbs that have been feeding and healing us for centuries were being lost to overharvesting and habitat destruction. She created the nonprofit United Plant Savers, now in its 20th year, dedicated to conserving and cultivating endangered herbal plants. "Plants need our help. Imagine a world without plants," she says. "Meat-eaters, those little cows and lambies and piggies all eat plants." So does Gladstar, who's been vegetarian since her teens. "I feel better eating plants." Everyone will. Even common weeds -- dandelion, nettle, burdock -- are purifying tonics for the body and taste great, too. Wilt dandelion with garlic and lemon juice for a salad. Blanche nettles and blitz them with cashew cheese for a gorgeous green dip. Thinly sliced burdock adds satisfying crunch to a stir fry -- tamari loves it, too. When all else fails, "herbal teas are one of the finest way to use herbal medicine," says Gladstar. "Eighty-two percent of the world still uses herbs for healing. We've become detached from that tradition, the healing and joy and vitality." Gladstar's dedicated her life to restoring that connection. In 1988, she created her second herbal academy Sage Mountain, a 500-acre botanical retreat in central Vermont, where Gladstar still lives and teaches. Now in addition to her two herbalist schools and nine books, there's accredited herbalist certification and online herbal academies including Gladstar's own. Yet the herbalist feels plants themselves are the best teachers. "I think plants are higher on the evolutionary scale than humans. They're incredibly evolved." People may always lag behind, but we're trying to catch up. Students come from all over the world come to study with Gladstar. It's "part of that whole movement of returning to those things that bring out the best of what is human, like cooking and gardening," says Gladstar. "We start to knit together a healthier lifetstyle." We're learning from plants. We're coming to value our own roots. The herbalist turns 66 this month and in 2015, will be scaling back the number of classes she teaches. But you can still learn from her favorite teachers. Get outside. Go on a nature walk. Or get nature's medicine into you in the most delicious way -- fresh herbs. Gladstar loves all plants the way they love her -- fully, equally, but to choose a few favorite herbs for winter wellness, she recommends turmeric, thyme, cinnamon, and her namesake. "I was named after rosemary." Not only does its warming, woodsy flavor enhance our food, "it's an antioxidant, wonderful for memory." When a recipe calls for a pinch, she says, "Put a lot in." 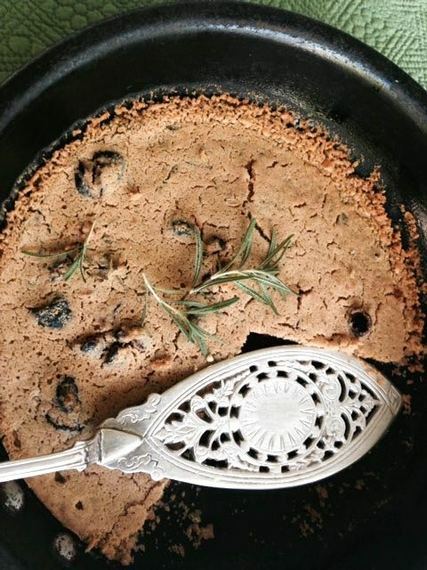 Socca, a crispy chickpea pancake from Provence, is easy to make, naturally gluten free and this one is redolent with rosemary, the herb for remembrance. Want more socca? Double the recipe and make in two batches. Best enjoyed right out of the oven. In a large bowl, whisk together chickpea flour, warm water and 4 tablespoons of the olive oil (the last tablespoon is reserved for cooking) until mixture forms a thick batter. Cover and let sit at room temperature for an hour (or more). Place an oven rack in the top level of your oven. Whisk up chickpea batter again to emulsify. Stir in crushed fennel seeds and chopped rosemary and season generously with salt and pepper. Pour remaining tablespoon of olive oil into a 9-inch ovenproof baking dish or skillet. Pour batter, swirling and spreading gently with a spatula to coat the pan evenly. Scatter chopped olives and sundried tomato on top. Broil socca for 8 to 10 minutes, or until it's golden and starting to set. Reduce heat to 450, move socca to the middle of oven rack. Continue baking for another 10 minutes or until the socca is golden brown and crispy at the edges. Remove from oven, cool slightly.